We hand-craft every wine we sell at Dancing Dragonfly Winery. We use a variety of grapes from both the Midwest and the Coast. Our red, white, and sweet wines are listed as they become available. We offer a 10% discount on wines by the case or mixed case. ​Click the link below to download a printer-friendly version of our wine list. A light, refreshing wine, with pleasant acidity, in a fruit forward style. Herbaceous nose (green leaves), with clementine and tan­gerine notes. Starts out with clear citrus flavors, but ends dry. It fakes you out; it seems sweet, but is actually quite dry. Winemaker’s notes: Polka is dry white wine made from Riesling and Prairie Star grapes. Food Pairings: We suggest Burnett Dairy Five-Year-Old Cheddar. Recent Medals: Gold, 2015 Indy Wine Competition. See additional medals here. It starts with west-coast Chardonnay grapes, then thumbs its nose at them, by including cold climate grapes, and masterfully barrel-fermented in french oak. The nose has pear, vanilla, and hints of green apple. It is mellow and smooth. We get a buttery flavor of vanilla, possibly mocha, with notes of oak. Color of dandelions. 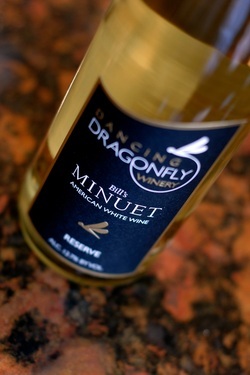 Winemaker’s notes: Bill’s Minuet is a dry white wine made from Chardonnay, Frontenac Gris, and La Crescent grapes. Food Pairings: We suggest DDW's own housemade garlic-herb dip on flatbread, a Ginger Rogers panini, Ellsworth Cheese Curds, Boar's Head Prosciutto Panino, or an Audrey Hepburn pizza. Recent Medals: Bronze, 2013 Mid American Wine Competition. Foxtrot is our first reserve white wine to bear Christine’s name, and rightly so. It has a bright, floral nose, and is a wonderfully complex wine. Foxtrot starts with a touch of sweetness on the tongue, then follows with notes of apple, lemon zest, and just a touch of oak. 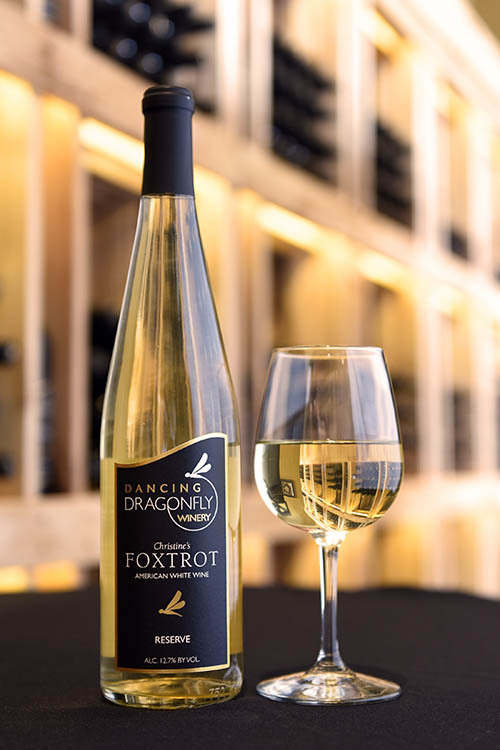 Winemaker’s notes: Christine’s Foxtrot is a dry white wine made from Frontenac Gris and La Crescent grapes. Food Pairings: We suggest a Rita Hayworth pizza, Bruschetta, or Abba Swedish Herring. Recent Medals: Silver, 2016 Indy Wine Competition; Silver, 2016 MGGA Wine Competition; Silver, 2016 Wisconsin State Fair. See additional medals here. Charleston’s nose is reminiscent of citrus fruit, with hints of melon and subtle floral notes (we get violets). This light, refresh­ing white wine, has a bright, crisp body. Its crispness reminds us of a Sancerre or Sauvignon Blanc. 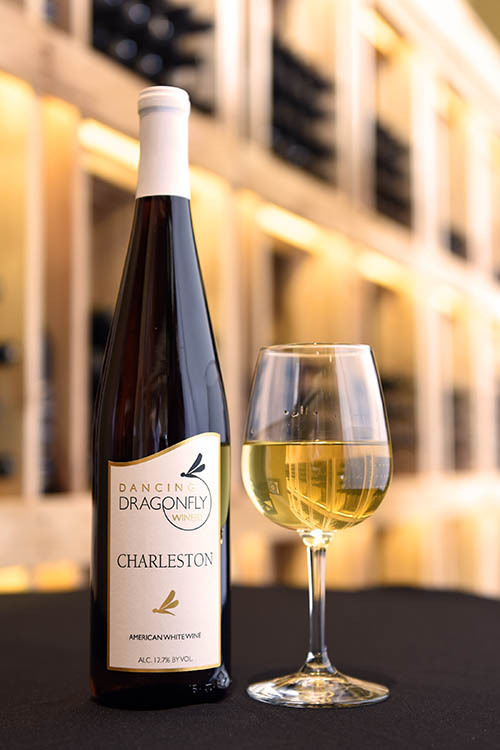 Winemaker’s notes: Charleston is a dry white wine made from Prairie Star and La Crescent grapes. Food Pairings: We suggestThe Rockettes pizza or Bass Lake Goat Muenster. Recent Medals: Gold, 2018 Indy Wine Competition; Silver, 2016 MGGA Wine Competition; Silver, 2016 Wisconsin State Fair. See additional medals here. Refreshing and delicious, this wine has a nose with tropical notes—notably pineapple, mango, and passionfruit. It is made entirely from cold climate grapes, and has a crisp finish. There’s also a little mandarin orange on the tongue. Winemaker’s notes: Promenade is semi-sweet white wine made from Brianna and Prairie Star grapes. Food Pairings: We suggestMolinari Sopressata, a Carmen Miranda Pizza, or our Red Pepper dip on flatbread. Recent Medals: Silver, 2017 Indy Wine Competition; Silver, 2016 MGGA Wine Competition; Gold, 2015 MGGA Wine Competition. See additional medals here. ​​​Boogaloo is a mellow, balanced rosé with hints of peach on the nose. It's lingering notes of tart cherry and raspberry are sure to keep you reaching for more of this summertime favorite. Winemaker's notes: Boogaloo is a semi-sweet rosé made from Frontenac, Frontenac Blanc, and St. Pepin grapes. Food pairings: We suggest Peppadew Peppers, Burnett Dairy East Coast Cheddar, or a Ricky Ricardo Panini. Recent Medals: Silver, 2018 Indy Wine Competition; Bronze, 2017 Wisconsin State Fair; Silver, 2016 San Francisco International Wine Competition. Jig has a nose of peaches and honey. This easy drinking white wine is reminiscent of summertime, with notes of green apples and fresh picked ruby grapefruit. Winemaker's notes: Jig is a semi-sweet white wine made from Frontenac Gris and St. Pepin grapes. Food Pairings: We suggest Molinari Salami or our housemade trout dip on flatbread.﻿ Recent Medals: Bronze, 2017 Wisconsin State Fair; Silver, 2016 Wisconsin State Fair; Silver, 2016 San Francisco International Wine Competition; Bronze. See additional medals here. The nose is light, like fresh air after a spring rainshower. Most prominently, the nose is peach with flower blossom notes. We’ve also noticed pineapple and pink lemonade. The taste is superb, with the flavors cascading over the tongue. Ballet has a long, balanced finish, and is the favorite white of many of our staff. Winemaker’s notes: Ballet is a semi-sweet white wine made from Frontenac Gris, La Crescent, and Prairie Star grapes. Food Pairings: We suggest Amber Valley Double Gloucester and Stilton or The Rockettes pizza. Recent Medals: Double Gold, 2018 Indy Wine Competition; Silver, 2017 Wisconsin State Fair; Silver, 2016 Wisconsin State Fair. See additional medals here. Calypso is made entirely from cold-climate grapes—mostly Frontenac Gris. It has a burst of fruit in the nose, we smell mostly pear with a little peach. When tasted, we get notes of nectarine and lemon/lime. It has a bold, clean, refreshing finish. 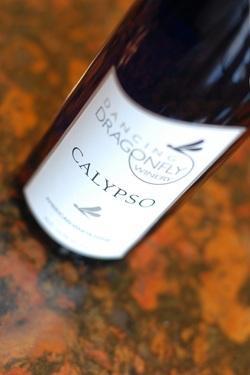 Winemaker’s notes: Calypso is a sweet white wine made from Frontenac Gris and St. Pepin grapes. Food Pairings: We suggest a Fred Astaire panini or Mike B. pizza. Recent Medals: Gold, 2018 Indy Wine Competition; Silver, 2017 Wisconsin State Fair; Silver, 2015 Wisconsin State Fair. See additional medals here. Jeté is a deep, ruby colored wine with big notes of oak and vanilla in the nose. Yet, it is a light-bodied red wine, with a delicate balance on the palate. We taste hints of licorice and peppercorn, with lingering young tannins. Winemaker’s notes: Jeté is a dry red wine made from Sangiovese, Frontenac, and St. Croix grapes. Food pairings: We suggest Indulgence Milk Chocolate with Sea Salt, Boar's Head Prosciutto Panino, or a Gregory Hines pizza. Recent Medals: Bronze, 2017 Mid American Wine Competition; Silver, 2015 Mid American Wine Competition; Bronze, Indy Wine Competition. See additional medals here. Christine’s CanCan captures the spirit of the Frontenac grape. After spending one year in French and American oak barrels, it is a classic reserve wine with a mature bouquet. This full-bodied red wine has soft tannins with notes of blueberry and cherry. Winemaker’s notes: Christine’s CanCan is a dry red wine made from Frontenac and St. Croix grapes. Food pairings: We suggest Boar’s Head Smoked Gouda or an Indulgence Cacao Nib 70% Cacao Chocolate Bar. Recent Medals: Silver, 2017 Mid American Wine Competition; Silver, 2016 Indy Wine Competition; Double Gold, 2015 Wisconsin State Fair. See additional medals here. Flavors of oak, leather, tobacco, and peppercorn accentuate this medium-bodied, well-balanced, red wine. Its garnet color and comforting mouthfeel make Bill’s Waltz a plush and satisfying wine experience. 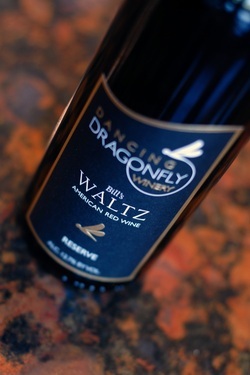 Winemaker’s notes: Bill’s Waltz is a dry red wine made from Marquette, Frontenac, and St. Croix grapes. Food pairings: We suggest Dante Sheepmilk Cheese. Recent Medals: Silver, 2017 Indy Wine Competition; Bronze, 2017 Wisconsin State Fair; Silver, 2016 Wisconsin State Fair. See additional medals here. The nose of this nicely balanced red wine features notes of cherry, chocolate, and black currant. It is dry and full-bodied with a smooth, velvety mouthfeel. Soft, refined tannins, subdued oak, and a lingering finish make Marquessa the perfect food wine. We suggest enjoying it with Bolognese sauce or red meat. Winemaker’s notes: Marquessa is a dry red wine featuring Marquette grapes. It is drinkable now, and should age nicely for the next few years. Food pairings: We suggest Pecorino Wiscono Sheepmilk Cheese or The Rockettes pizza. For dessert we recommend a Deconstructed Pecan Pie. Recent Medals: Silver, 2018 Indy Wine Competition; Silver, 2017 Indy Wine Competition; Silver, 2017 San Francisco International Wine Competition. See additional medals here. Tap Dance is one of our more subtle wines. It is wonderfully approachable, with aromas of orange blossom and cherry. Tap Dance has complexity and depth (that will improve over the coming months), and is a balanced, well-rounded wine that exhibits flavors of cherry and oak, with a buttery finish. Winemaker’s notes: Tap Dance is a dry red wine made from Marquette, St. Croix, and Frontenac grapes. Food pairings: Boar’s Head Soppressata and Provolone slices (with Cucina Viva Parmesan Crostini), or The Rockettes pizza. Recent Medals: Silver, 2017 Indy Wine Competition; Silver, 2017 San Francisco International Wine Competition; Double Gold, 2015 Wisconsin State Fair. See additional medals here. Stone fruit and raspberry make up the nose of this approachable, light-bodied red wine. The taste is reminiscent of dark cherry, with notes of vanilla and a hint of pepper on the back of the tongue. It has a pleasant, lingering finish, and a lovely ruby color. Winemaker’s notes: Ballroom is a dry red made from Frontenac, Sangiovese, and St. Pepin grapes. Food pairings: We suggest Bass Lake Goat Jack with Habanero or a Cousin Vinny Pizza. Recent Medals: Silver, 2017 Mid American Wine Competition; Bronze, 2017 Wisconsin State Fair. Sashay represents our winemaker’s expression of an unoaked Frontenac. It has a vibrant, rich color and a strong nose of cherry, blue­berry, and cocoa. Sashay has a smooth and creamy mouthfeel reminiscent of a mature, full-bodied red. It could be said that this wine is older than its years! 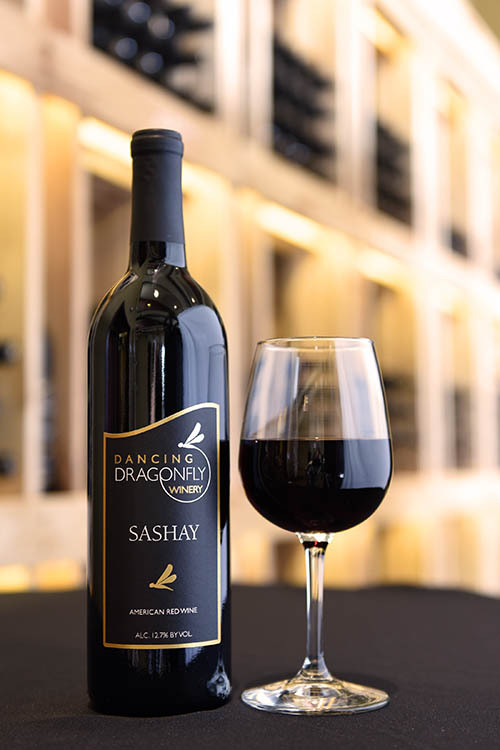 Winemaker’s notes: Sashay is a dry red wine made from Frontenac and St. Croix grapes. Food pairings: We suggest a Gene Kelly panini. Recent Medals: Best of Class, 2018 Indy Wine Competition; Silver, 2017 Indy Wine Competition; Silver, 2017 San Francisco International Wine Competition. See additional medals here. Aromas of Ranier cherry make up the nose of this fruity, young wine. Flavors of blackberry and pomegranate give way to a peppery, earthy finish. The wine feels smooth, while still having an acidic backbone, making it the perfect accompaniment to holiday meals. Winemaker’s notes: Dragonfly Nouveau is an off-dry red wine made using carbonic maceration with Marquette grapes. Food Pairings: We suggest Pecorino Wiscono Sheepmilk Cheese or Indulgence Cacao Nib 70% Chocolate Bar. The nose is mostly berry, with a spice finish. The taste seems complex; we taste persimmon, pomegranate (not to get snooty about it), red licorice, and leather. We taste blackberry on the front of the tongue, a spicy tingle at the back, and vanilla. One of our tasters said it “makes you want to dance.” Garnet color. 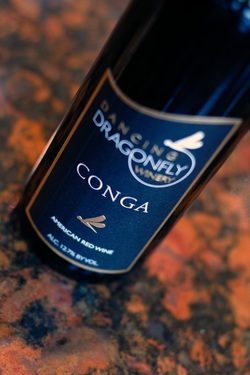 Winemaker’s notes: Conga is an off-dry red wine made from Marquette, Frontenac and St. Croix grapes. Food pairings: Bass Lake Goat Muenster or a Mike B. pizza. Recent Medals: Silver, 2018 Indy Wine Competition; Silver, 2014 Wisconsin State Fair. See additional medals here. The nose reminds us of blueberries and blackberries, in sharp contrast to the smooth taste. We taste dark, sweet cherry, and elements of apple pie spices (allspice). It has a long, inviting, spicy finish; dark plum color. 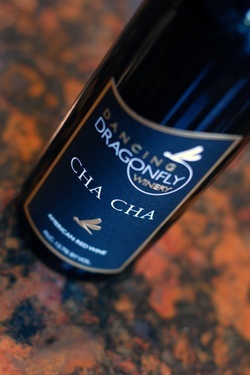 Winemaker’s notes: Cha Cha is a sweet red wine made from Frontenac, Marquette, and St. Croix grapes. Food pairings: Tulum Sheepmilk Cheese, Boar’s Head Smoked Gouda, or a Mike B. pizza. of green apple, and lemon zest. The finish is bright and acidic, making it perfect for pairing with most bold cheeses. We suggest Boar’s Head Imported Gold Swiss cheese, oven baked parmesan cheese, or Amaretto Fudge. Recent Medals: Double Gold, 95 points, San Francisco International Wine Competition; Best of Show, 2017 Mid American Wine Competition; Double Gold, 2017 Indy Wine Competition. See additional medals here. Our winemaker’s tribute to pure fruit wine. Unashamed of its origins, it bursts with the taste of fresh raspberries, in a well-balanced wine with just enough sweetness and a clean finish. 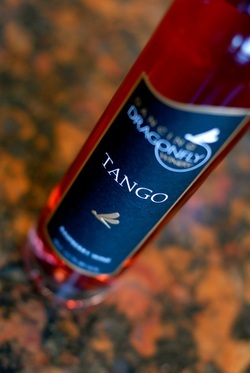 Winemaker’s notes: Tango is a sweet dessert wine made from 100% raspberries. Food pairings: We suggest an Indulgence Cacao Nib 70% Cacao Chocolate Bar. Recent Medals: Bronze, 2016 Wisconsin State Fair; Double Gold, 2015 Wisconsin State Fair. See additional medals here. Made from Frontenac Blanc grapes harvested and pressed on a cold December day, this true ice wine is an expression of our winemaker’s dedication to fine cold climate wines. We get ripe apple and clay on the nose. The taste is remarkably smooth with tropical fruit flavors of banana, pineapple, and mango. Winemaker’s Notes: Hula is a sweet ice wine made from Frontenac Blanc grapes. Recommended Pairings: We suggest Pecorino Wiscono Sheepmilk Cheese, Boar’s Head Gruyere, Amber Valley Double Gloucester, or Amaretto Fudge. Recent Medals: Bronze, 2018 Indy Wine Competition. Bolero is a classic Ruby Port; perfect after a nice dinner with a little cheese or chocolate. It has a wonderfully smooth yet complex body with notes of cocoa and mocha. Bolero is a great balance of flavors with gentle acids and a sweet, lingering finish that make this a memorable dessert wine. 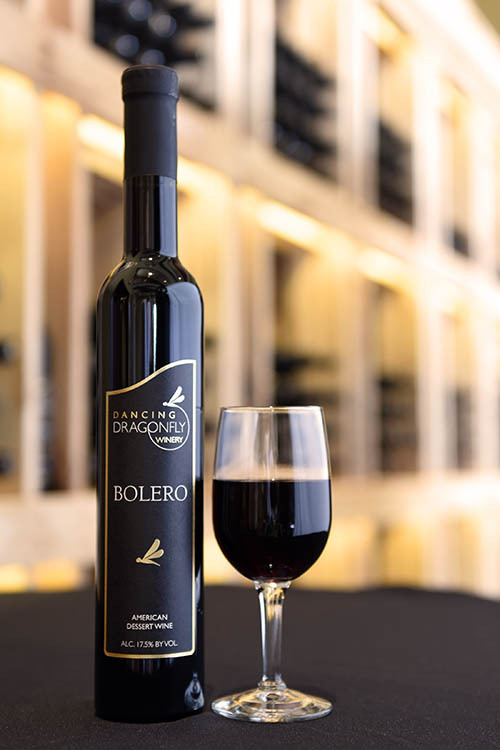 Winemaker’s notes: Bolero is a sweet dessert wine made from Sangiovese and Frontenac grapes. Food pairings: We suggest St. Peter’s Blue Cheese or an Indulgence Cacao Nib Raspberry/Chipotle/Pecan Chocolate Bar. Recent Medals: Silver, 2015 Wisconsin State Fair. Winemaker's notes: Bill’s Bossa Nova is a sweet dessert wine made from Sangiovese grapes. Food Pairings: We suggest an Indulgence Milk Chocolate Bar or Tango Fudge. Recent Medals: Silver, 2017 Indy Wine Competition; Silver, 2016 Wisconsin State Fair; Silver, 2016 San Francisco International Wine Competition. See additional medals here. Our sparkling wine is made using one of the oldest wine making styles called Méthode Champenoise. It is a painstaking process, where secondary fermentation takes place inside the bottle itself. We have two different dryness levels, Brut Nature and Brut. "Brut Nature" is a French term, and means Brut without any sweetness added at all. "Brut" is technically dry, but has a slight bit of sweetness added. Recent Medals: Gold, 2016 MGGA Wine Competition; Silver, 2016 Indy Wine Competition; Silver, 2016 Wisconsin State Fair. See additional medals here.